Micro-fine, oil-absorbent powder, with a hint of yellow to blend perfectly with your natural skin color. Unlike other finishing powders, it is flash-friendly so your face won't look white in bright lighting or photos. It is so finely milled that it fills in fine lines and pores, giving you a smooth, flawless, airbrush finish. Use Buttercup Compact Powder to touch-up and maintain that flawless, flash-friendly finish, throughout the day. Apply with a powder brush on bare skin or use to set your foundation for the most sophisticated, matte finish with zero flash-back. 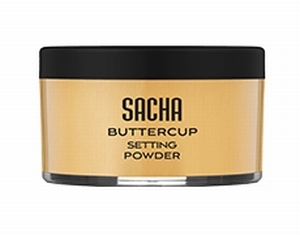 Apply over any of SACHA's cream-based or liquid foundation using a powder brush. Lightly dust on the powder over the face evenly. Talc, Mica, Aluminum Starch Octenylsuccinate, Zinc Stearate, Calcium Carbonate, Iron Oxides, Titanium Dioxide.